home | Acid Test Chronicles | The Acid Test Chronicles - Page 29 - . . .
Around the time period of April 2008, a very strange, very amateurish-looking Acid Test handbill for the Fillmore on Jan 8, 1966, appeared on E-Bay and was sitting up for several days before I noticed it, I looked at it carefully. Nobody had ever seen one like this before. Every day I scan E-Bay for Acid Test related items and on this day, there was some "energy" about the piece because I was scanning down through the page and it literally jumped out at me as being something interesting. Now, after reading that, and studying it carefully, I did what I usually do, I checked the feedback of the seller, the seller's location, what other items they had for sale etc. The item was listed and bid up to around $100. I studied it more, very carefully, and realized the simplicity of it, and pondered and questioned it back and forth in my mind. I noticed the "eyeball" looking up, and thought, how interesting, there is an "eye ball" in the top of the famous poster that reads, "Can you pass the Acid Test?" Now this "eyeball" looked different, but nonetheless, to me, it represented a "clue". I contacted the seller and asked if he was interested in selling me the item for $400, and he agreed, removed it and mailed me the item. The next week, I took it in to Dennis King and had it authenticated, and Dennis concluded he believed it was real, and not faked. Dennis said he believed it was printed on Day-Glo green paper which had faded. This gave me a boost of confidence in the item, and likewise, confidence in the seller. At the same time I contacted the seller to aquire it, I also asked where the item came from, and how he happened upon it. The seller was very nice, and responded that he "got it from a record swapmeet where it was inside an old "Grateful Dead mono version of the first album." So, having been told this, I told several people including Joe Armstrong, who insisted that he believed the handbill to be questionable. So as time went on, this just remained an extreme oddity in the Acid Test collecting community. I was happy though, and I knew I had something very special, as simple as it was, I thought it to be one of the coolest item I have ever seen, as far as original Acid Test collectables. The simpleness of it reminded me of kids screwing around and having fun, and being "innocent, youthful and creative". I felt that's what made it genuine, even though all the other "standard" Acid Test stuff was much more highly specialized in their design, when you consider the Trips Festival Poster, Paul Foster Poster, SF State Poster, Trips 196?, or the Graduation Poster. However, this was a pretty early piece compared to the rest of them, when the Acid Tests really got going. Strangely Enough, this is from a website Titled "Dark Star" on Alchemy, Freemasonry and Nibiru, the 12th Planet (Sitchen)- Weird! < body> About a year went by, and I was contacted by Joe, and asked whether or not I thought a particular handbill he had a pic of, was real or not. I saw the pic, and noticed right away, the design of the lettering was the exact same as my Fillmore handbill I acquired a year before. It was also beaten up pretty good as was the Fillmore handbill from before. I had completely forgotten about the seller who I acquired the Fillmore handbill from originally, and never put the two together, to contact him about it. This time, as in the last time, the handbill design had never been seen before. It was another "one-of-a-kind" item, like the Fillmore handbill. The handbill this time was for the Carthay Studios or (Pico) Acid Test for March 19, 1966, that is pink, and different than the more commonly known handbill, which is golden, and surfaced from Kesey's barn a few years back. I replied that I believed it to be real, and if he didn't end up acquiring it, to let me know, as I would be interested. Joe passed it up, but acquired it for me from Andrew. After I recieved the handbill, and paid a several thousand for it, I was told by Joe the handbill came from Andrew and was swiped off E-Bay for $1000, after talking the seller into selling it to him in a seperate private auction. I was happy to pay this, knowing Joe had not made anything from the transaction and him and I got along well at this time. I wished I had picked it up or found it earlier, though, and save a few grand. Andrew has a way of doing this to people, because all Andrew cares about is money. Well, that's what Andrew ended up with, nothing but money, so this item escaped him, and that was fate, or destiny, I believe. At the time Joe passed it up, he tol dme he couldn't affor it. I later found out from Joe that he didn't buy it because he thought it suspicious and that it came from the same person as the old Fillmore handbill but the story had changed. I was not so concerned about this, but did inquire as what had "changed" in the story, and I was told that the seller claimed this came from his friend, and would not give details about it. I never saw the original auction, which is rare, because I see every Acid Test auction that goes by, since 2002. So, I cannot say what the seller was claiming at the time, exactly. Either way, it did not matter much to me since I now had it, and believed it to be real. I figured that if the person who designed the other (Fillmore) handbill also designed this one, which they did and that was obvious...and since I knew the Fillmore handbill to be real, I knew this one was real as well, because of the same strange "barbed" or "electric" lettering of Acid Test. Joe and Andrew on the other hand believed it to be fake because the story had changed and they had never seen one before. I think Andrew figured he could sell it to Joe and make a quick buck, then Joe didn't want it because he felt it was fake. So, I grabbed it, being all the wiser. About two weeks later my very good friend called my attention to a piece on E-Bay that had been up for about 2 days maybe almost 3 days. It was bid up to $750 approx, when I saw it, and I studied it carefully. The first thing I noticed was the "eyeball." 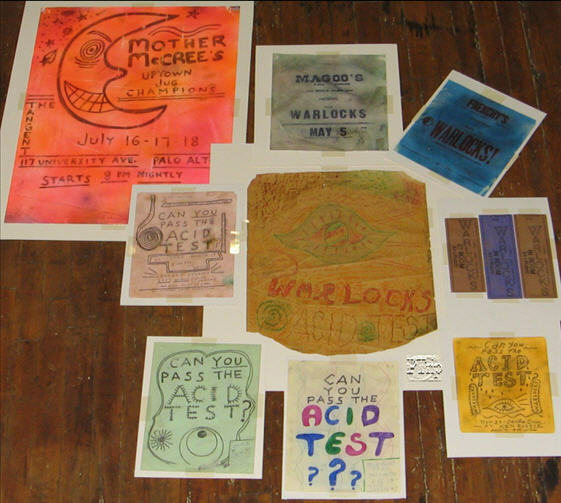 It was a small poster for the Warlocks at Ken Babbs's Spread on Nov. 27, 1965, for the very first known Acid Test. I was super excited by this and I felt that there was no way someone could come up with this on their own, and make it look so real, and I got that sense of "energy" from it and I figured I would contact the seller and see what I could do. My first offer was $5k. So, the seller called me up and after some friendly conversation he placed the item in a private auction for me, and I made my bid and won it. Next, I noticed the seller's name sounded familiar and I looked through my records, and noticed it was this same person who had the Fillmore handbill one year ago, then the pink handbill from LA a couple weeks prior and now this. I started to get a little bit, just slightly suspicious, so I called him up, asked him some questions and found out some very interesting information. The Warlocks mini-poster was listed as being sold for a friend who could not use computers very well. He asked him to sell it for him. At this point I will refer to the seller as "T", which is the first letter of his name. I do not know if he wants to be known, but I know him well. I asked him about the changing story, and I was told the reason for this. At first, "T" didn't know the fellow had more stuff and wanted to sell it for him as time went on. In addition the fellow, whose name I can now reveal, Harvey, did not want to be known. I could not even get his name. When Harvey first asked "T" to sell the item, this is the story they came up with, (the old record at a swap meet) to avoid anyone knowing anything more, for what reason, I did not know yet. Granted it was slightly suspicious but I decided "T" sounded very genuine, and down to earth and very friendly with me and honest, it seemed to me, as well. So I "went with it," my gut intuition. I asked him why the story changed and he claimed he didn't know what else would be sold from the guy, and now he decided to tell a little more truth. He did what his friend had asked him to, and said what his friend, Harvey, suggested he say. So, now that Harvey had another item, they started to say that the item belongs to an old hippie friend who has a hard time using computers. That is what was listed in the ad for the Warlocks mini-poster. "T" had simply done what was asked of him, and appeared to very genuine and honest with me. Also, I had very little doubt about the item, so I decided to trust him, although I found out Joe Armstrong passed it up because he knew it came from this same seller and now he was more suspicious than ever. Andrew, likewise probably passed it up because he realized he coulnd't make any money selling it to Joe. I figured, "oh well, I know it's real." How did I know? Because who else could come up with that item from their "creative mind," but someone who was there, and actually part of the scene? I mean come on....the "eye of horus"? (Illuminati Symbology) I also noticed the way the art was on "Acid Test" was kinda similar to my colored poster, or rather the Standard Paul Foster design, on "Acid Test". There is this "Barber Pole" style in the actual lettering on both designs, the Babbs Warlocks mini-poster and the Foster Poster. So I knew there was a real item here, and I was confident the other items were real too. Well, in a following conversation with "T" after I aquired the Babbs Warlocks piece, I told "T" about how I acquired the other item and how it came to me. When I told him Andrew charged me several thousand, he felt really bad for me. (I don't blame him, I got jacked) But I told him I was allright with it, since I just appreciate having the item, and if I had to pay a little more, well, that will work itself out. This conversation began a series of e-mail and phone conversation exchanges between us both. "T" promised me at that time, he would no longer deal with anyone on E-Bay or anyone who contacted him ,and he would only work with me, should his friend come up with anything else. This made me very happy, and it started a very good friendship between us which still exists today. At this point, realizing that several people thought the items to be fake, because the changed story, that it was a good time to keep my mouth shut until I knew more info and had all the items from this "special" collection. That could be months, years, or a half a century for all I knew. I decided not to take either of these new items in the Dennis King just yet, only because I didn't want any mentioning anywhere of these pieces I was getting. Someone had started a discussion on EB and put the item down, calling it a fake. I retorted the info and after 3 pages, the thread got left with..."Well, I will trust Dennis King's opinion. Has he seen it yet?" That post remained for many months and I stayed away. I asked "T" if he could get his friend to write me some kind of letter of provenance, describing just briefly how he obtained it and where it was obtained from, (the Babbs Warlocks Spread mini-poster.) I recieved the letter right away, and it was written in a frail and aging hand. That letter is posted on Page 11 of the Acid Test Chronicles under the Warlocks/Spread image. After a couple months went by, I got an e-mail from "T", with pics of another item. This item was a Poster for the Warlocks at Magoos on May 5, 1965. It was their first show. He asked me what I thought it was worth, and told me he felt bad, did not want to have me pay lots of money like I did to Andrew and asked me to make an offer and he would accept it. I made a fair offer, but it was not super substantial. It was what I could afford, and very fair. Afterwards, when he mailed it off, he wrote me again. This time, he told me he found another poster but he didn't want me to pay for it, he was going to have his friend give it to him to give to me as a gift. This Poster was for the Frenchy's Warlocks gig on June 18, 1965, which was Phil Lesh's first show. It was a gift. (Thank you, "T") After this gesture, I was solidified in my confidence about my new friend and his genuine sincerity. I mailed him a gift in return, cds and dvd of sixties music which he listens to and enjoys,and we moved into a new level of friendship. We exchanged e-mails about all kinds of things, talked on the phone about the Grateful Dead (he's a head, a bit older, but not much, a record collector), odd stuff, history of Acid Tests and all kinds of common interests. We got to know each other well over the next few months. This happened around mid-June or so, and we've had a few dozen e-mail exchanges and a dozen or so phone conversions. Another month went by and now it's about mid-July. I asked my friend if there was anything "happening" and he wrote back and has something interesting. He mailed me the pics and I made an offer to him. Same situation, same approx value. This time the picture was for (3) Warlocks Tickets for the In Room in Belmont on Sept. 1, 1965. (2) Tickets were intact and complete, and the other was torn off at the top by the perforation. I inquired about these and "T" told me Harvey remembered there was a raffle that night, and when you entered, the top part is where your name went, and then during the evening sometime, the prize was awarded. Unfortunately, Harvey did not remember the prize that was given that night. Fast forward one month ahead, to around 7, of this year, 2009. I had written to "T" to see if there was anything new about. I was told he would contact his friend in the next week or so. About 5-7 days later, on the 13th, I got the pics. They were pics of the two original art items, the Mother McCrees Poster from the Tangent in July and the other item, the hand-colored ink pen and marker handbill for the Palo Alto Acid Test. I was completely blown away by this recent discovery in his "attic" supposedly. Wow! I offered him a very good amount of money, feeling very blessed by these posters and handbills I have been receiving. I knew that the last couple deals were very good in my favor, so I felt like returning the favor and paid a bit more this time. I was told by my friend "T", that "Harvey tells me every time he parts with these items, 'You have no idea how hard it is for me to part with these. They are a part of my youth and remind me of the time, the electricity in the air, how things were, and how they have never been the same since.' "The idea I got from my friend about Harvey was that he was "disgusted with society", removed, a bit of a recluse, and in lots of pain from health complications. These things were told to me in a roundabout sort of way over a short time period. After I was told this, I felt like maybe I was helping him, or maybe I was hurting him, but either way, it's his choice and if he needs medicine, then maybe he needs me, and the money I was giving him for the items, in order to feel "okay". I was saddened by this. But what can one do? After this incident, and my initial shock at what happened, I started to wonder what else Harvey may have had that he left behind in the house. After all, he was now passed away, and if there was anything else, what would happen to it and what if it got thrown in the trash? One of the hardest things to do at this point, was to ask my friend, "Hey "T", can you find out if there was anything else there he may have left behind? How crude I thought. But, if he had left anything, what good would it be for me to just walk away from it all, just because he had recently died. Maybe, just maybe, I thought, there was more, and if there was more....who knows what else could be there? During the next week, I contacted "T" several times to let him know how urgent I felt it was to check out the location where Harvey lived. I was told he lived with a younger woman who is moving out, to another state to live with her folks. I pleaded kindly with "T" to check and see if he left anything behind. One week went by and 3 e-mails and one phone call later, and I finally got a reply that was positive. Last e-mail from "T" reads...."Josh, sadly, last pics"
I read the e-mail and it turned out that the girl had moved out, and on the way out of town, or right before she left, she brought over the "last item" Harvey left behind. "T" claimed he half-heartedly believed her, but she claimed this was it. The female living with him did not have any interest in the stuff, did not know what it was and would claim it looked weird everytime she would bring the items over for "T" to sell to me. These pics were the Original Artwork, Hand-Colored in Crayons - The Warlocks Acid Test Poster with the eyeball. I could not believe it, but I also did not know what it was, actually. I realized the "box", or in this case, a, circle, was left blank, and assumed it was some kind of prototype poster for the early events. I was confused by it originally, and did not know what to think. I read "Designed by Captain Trips" and laughed to myself, to be honest. I told "T" that I know people referred to Jerry as Captain Trips but I did not think it was that early and even if it was Jerry's art, how could I ever prove it? Considering how little provenance I already had, I was not about to assume that this was Jerry's art. So I made my offer, and it was accepted. Now I just had to find out "Whatever It Is?" Now that Harvey had passed away I felt like it was okay to ask "T" what Harvey's full name was. I was right. "T" told me it was "Harvey Pollard". Well, I believe him because the letter Harvey wrote to me concerning the Warlocks/Spread piece, was signed "H.P." - And besides, "T" has never lied to me so far, so why wouldn't I believe him? If anyone out there knows who Harvey Pollard was, I would be interested to know more about him. Like I said, I have my own personal doubts, but they are more like, "How could that be?" "How could I happen upon this?" The guy had some amazing stuff, so it's fitting. Hi Josh, A quick look says there's no reason to exclude the possibility of Jerry having written this. I will have to spend more time with the writing. It seems logical Jerry would be the one to make the posters because he was the "artist" of the group. Had been drawing and painting for some time by then. This looks quite fragile also, you may want to do some conservation on it. Let me know when you receive it. Next, I got this, after sending some more pics to her. Then this, along with some writing samples. he makes A's differently depending on upper or lower case but has consistently made that letter the way you show it. the lower case A is typical, as is the e."
Well, as I was taking in the realization of the situation many powerful thoughts went through my mind. I started to imagine and wonder what all of this could be. 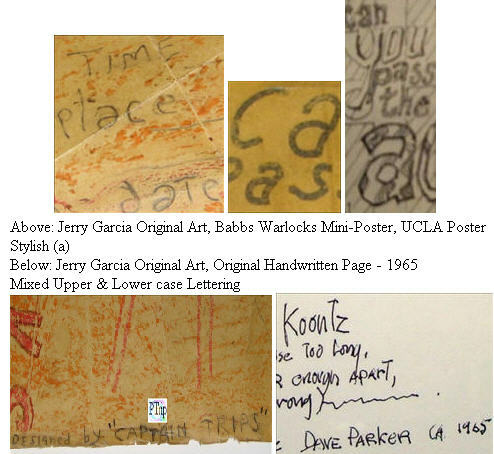 Realizing there were connecting between the Original Art piece and Jerry Garcia's original handwriting made we start to think about "art" and the possibilities. What about the Mother McCree's poster?, I wondered. What about the Warlocks/Spread mini-poster?, I continued to wonder. I started looking at images all together and started thinking about symbols and then like a flash, I started to see all kinds of similarities. Together with two friends we came up with a good bunch of connections and clues. That's when it became obvious to me that Jerry must have designed these other Acid Test items, or many of them, as well as the Original Art piece. Well, I have asked and asked, everyone I have run into over the years, from the Kesey's to Lee Quarnstrom, to Mountain Girl, George Walker, Ken Babbs, Mike Hagen, Hank Harrison, Phil Dietz, and a couple others. So far, nobody has remembered who drew any of the funky looking items, but everyone agrees that I have shown them to, that they look like what they would have been doing at the time. I slowly dawned on me that this collection was either pieced together by someone who was very close to Jerry or someone who Jerry knew valued the stuff enough to hold onto it and not get rid of it, or possibly, even, he was chosen by Jerry to be the archivist or steward of the stuff, for possibly one of two reasons; either because the person was already collecting the stuff and Jerry knew he would be the proper one to leave it with, or because Jerry himself made them, saved them, and left them with him at some point. Of course, this is all speculation, but one does have wonder about these questions. Next thing I did was take everything in sets of 3, to Dennis King for final authentication, since I now knew I had everything from the collection. Once Dennis had seen them, he was impressed from what I could gather. We spent over three hours so far looking over everything together. Dennis has seen all 9 items now. It was determined that three different methods were used to make these. Some were done by hand, obviously. (Original Art piece, Mother McCrees and Palo Alto handbill). Some were done by Letterpress, (Magoos , Frenchy's and the tickets) and others were done most likely, by a very interesting method, a ditto press. Dennis concluded the tickets perforation was not machine made, but by hand roller type perforator. Dennis consluded this made sense and helped establish part of the reasons why the tickets were determined to be genuine. He explained to me the process for doing Ditto prints and how the artists would write or draw on a type of paper similar in some ways to carbon paper, in that it was lined with a wax bottom and whatever was drawn or written onto the surface would come out in the wax on the paper underneath. This was a common method for printing in those days. Dennis showed me three items which were done that way, from 'back in the day.' The Warlocks Spread piece, the LA Pico piece, and the Fillmore piece were likely done using this last method. Dennis concluded that he did not believe someone made these up in the last few years. His comment on them about age was they are "old", and they were not done recently in time. Dennis was careful not to say he believed they were real, only because he has never seen any of them before, and how can you authenticate anything with absolute certainty without having some real evidence such as another item that is exactly like that one, or if it came from a known reputable source, however, "reputable" is loosely defined, itself. You will see why in a couple pages. Dennis did comment several times on the impossibility for someone to do this, since "Nobody has been able to get fake stuff past me." The wide variety of styles of the items, print methods, types of paper All of the items are made with completely different types of paper. As well, each item is hand-torn, not cut. Dennis observed that the items looked "Intentionally distressed", which confused me at first, but I kept listening. He believed they were made, "intentionally" to look distressed. Dennis stated, "someone, whoever did this, and made these, made them to look like they were beaten up or damaged somehow." He went on, "This Babbs piece was 'pressed' by a machine or something, you can tell there were folds but it was straightened out by a press". About the Frenchy's Poster he stated, "That oil stain is not an accident, it's done intentionally, to create an effect or something." 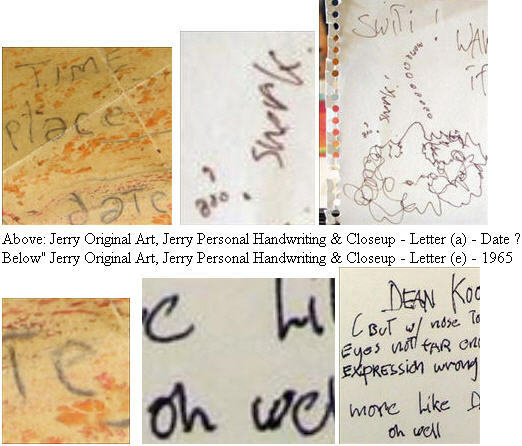 Continuing, Dennis said, "I don't believe any of it is fake", and he also stated, when told about the idea that I figured it was Jerry's art designs, he said, "it feels right and makes sense, Jerry was an artist." 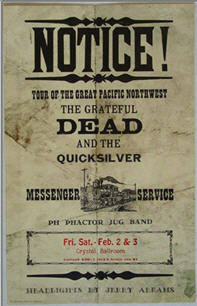 At this point I would like to mention a Poster created by the Dead in 1968 - Notice: Tour of the Pacific Northwest - Oregon - This Poster looks as if it was damaged, but it was done "artistically", and "creatively". Dennis mentioned a story to me, about how many of these were also intentionally "burned", literally, around the edges, to enhance the effect even more. I never knew that before. I find it interesting considering how all these items appear to be intentionally "distressed" in various ways. It is done artistically, and the best example would have to be the Frenchy's Poster. That one has paint splashes and sprays and spills, and a deep, almost soaked vegetable oil like stain penetrating all the way through different areas of the poster. I figured it looked "proper" for the age and the condition overall, but Dennis corrected me on that, and helped me see how they were done with specific intentions to create a certain "effect". The Magoos poster is also obvious, as far as intentional design of certain features, because the poster is very psychedelic colored, in it's pastel background shadings, which "appear" to be from age alone. However, when one examines it closely, and considers the "effect" created that comes through, to me it appears that parts were sprayed in a particular color with something laid down across it in that area, then moved over slightly, then sprayed with another color, and then moved to respray and on and on. On Sept. 3, 2009, both Roberta and Dennis saw the McCrees Poster and the "Captain Trips" Original Art piece. Dennis concluded the McCrees was definitely Original Art as well, as far as he could tell. He appeared confident. There is no doubt that the Captain Trips piece is Original Art. One of the things Dennis noticed about the McCree's was that it was either, most likely, printed on Day-Glo paper, (and he commented the paper was definitely consistent with what he was familar with from that era), or that it was printed on a similar paper then spray-painted, then had the lettering hand-done afterwards. Well, I have visited with Dennis many times over the last few years. I have never seen Dennis very impressed or surprised before. Generally he sees many things, and even the rare stuff seldom impresses him. Well, I could tell this time it was a little different. When I showed Dennis the Original Art piece, "Captain Trips", he was taken back a little, and commented something like, "How odd." I think I actually saw Dennis' face light up a little. He appeared surprised, impressed, and very interested. Dennis noticed right away it was made on wax paper. Another thing Dennis noticed about many of the items, but it is especially obvious on the piece of Original Artwork, is the fact they are "torn" at the edges. The Carthay Studios piece was torn at the edges, or "torn off" from another section, and several others were similar, like the Palo Alto handbill. No sharp edges, very rough and from tearing them apart, most likely. Possibly the art was done in various ways, then the paper was seperated, or it was seperated prior to applying the artwork. But either way, many of them were done this way, not cut sharp. The overall conclusion from what I can gather from Dennis, is that he believes the collection to be genuine and sees no reason to believe it was faked or created "later". There was nothing wrong with any of the items that made Dennis genuinly suspicious & there was no reason to doubt the authenticity of them. There are many items that Dennis has never seen before, although Dennis has probably seen more items than practically anyone in poster collecting. 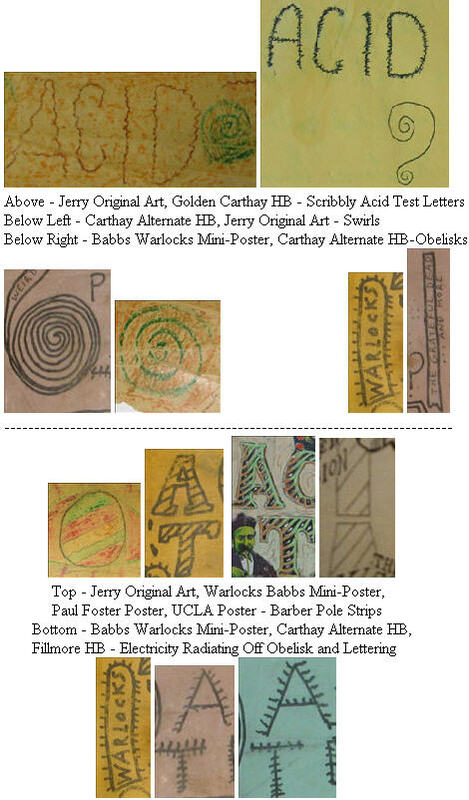 It appears that Harvey was either in possession of Jerry Garcia's collection of Acid Test art, or he collected everything meticulously, including some items he most likely aquired directly from Jerry himself. This is mere speculation at this point, but it appears that Jerry Garcia designed much of the artwork for these items in the earliest days of the Acid Tests. I will not argue that Jerry designed these other items, rather I'll let people figure it out for themselves and reach their own conclusions. I believe that Jerry Garcia DESIGNED the following items: Mother McCrees poster, CREATED the Warlocks Magoos poster and Frenchy's Poster, DESIGNED the Babbs Warlocks mini-poster, DESIGNED the Fillmore handbill & the Carthay Studios one-of-a-kind alternate (pink) handbill, and also MAY HAVE DESIGNED the UCLA Acid Test poster. Possibly, as well, the Carthay Studios (Golden) Pico Handbill too, or at least the lettering in Acid Test and the question mark that follows. However, so far I see no reason to assume that Jerry wrote in the info into either of the Carthay Studios handbills. Possibly, the lettering for "Acid Test", or possibly even, he did do all the writing. I just do not know at this point. Now that the whole storm had blown by, and the collection is together, and I look back on the situation in a different light or perspective, I can see great depths of spiritual influence in this whole "happening." My whole life I have always been a very spiritual person. I believe in divine provenance. Everything that happens, is meant to be. There is a reason for everything. And ...our higher-self always guides us and decides ahead of time, in cooperation with other higher-selves, what events will shape our lives. When something happens, there is a reason for it, even if it does not appear or reveal itself in the same moment the event is happening. Sometimes, events happen, and you just kinda of 'know' that you are heading in a certain direction. Everyone has been on a rollercoaster before and sometimes segments of life are like those rollercoasters. Well, since the age of 15, I have been a tripper, an activist, a prankster at heart, a serious fan of Kesey's and practically a 23 year follower of Grateful Dead shows and Jerry Garcia's music, having been to over 125 Dead shows with Jerry, approx. 20-25 Solo Jerry shows, and over 200 Ratdog, Phil Lesh, Other Ones, and The Dead shows since Jerry's passing. I know it's not a lot to many people out there, but I don't tend to leave the state for shows anymore. Since I started collecting seriously, in the late 1990's, I have seen the rich folks take advantage of their positions, I have had deals for extremely important posters gone sour over the interference of these people, throwing money around like it will never run out, and I have seen good people get screwed over and over by these kind of folks, including myself. I have always thought to myself, "you know, there are all kinds of posters out there for people to collect, but when it comes to Acid Test stuff, this stuff should not fall into the hands of the rich". It belongs in the hands of "family". Why do I feel this way? Well, because money does not value art. It cannot value art. Too many people out there collect rock 'n' roll posters simply BECAUSE they are worth lots of money. There is nothing wrong with that, it's like baseball cards or comic books. Well, with both comic books and coins and stamps and movie posters and on and on, with almost all collectables, there are more than one or two of them to be had, and eventually, you'll find one, given the affordability. With Acid Test posters, as well as many Rock and Roll posters, there are only one or two. What makes Acid Test stuff any different than other Rock & Roll concert posters? Well, most importantly, the Acid Tests launched it all. At least what I consider to be the most important period in the evolution of consciousness on this planet. Rocket fuel for the planetary mindship. People start to collect what interests them but eventually the hobbie is no longer a hobby but a mission being pursued to increase value, not for the fun of the hobbie and collecting. Money becomes the central issue. If you ask yourself, "What is my favorite poster in my collection?" And then you answer that. [to yourself]. Then I would ask you, would you sell that poster for 1 million dollars? Most people will say "yes, of course." Well, how many people out there own a poster or original art piece that you would NOT sell for 1 million dollars? How about 50 million? If you would sell something for money, and amount of money, than money has more value to you than the item. Maybe someone says, "well, it's what I could do with the money." True, but unless you or someone you love is actually dying and their life needs to be saved, that's different, but to do anything materialistic with it, means something else has more value to you. Ever since I first acquired my colored Prankster Foster poster with the signatures, I have felt it was something I could never sell for any amount of money, no matter how much was offered, even 100 million dollars. That was never a question for me. I feel very strongly about this. It means more to me and I understand it's importance and I appreciate it, and I believe that I appreciate it more than anyone else in the world could or would. Well, I also feel that way about many of my acid test items, especially the ones acquired from Harvey. The best thing is that it came to me, the second best part of all is, I didn't pay that much for any of it. Certainly not a fraction of what it would have gone for on the open market, had people known it was real, and had people trusted the source. The way things worked out though, nobody trusted the source but me. Nobody trusted the items but me. Nobody took the gamble but me. So, obviously nobody wanted those items or understood them, or cared to try to figure out and the legitimacy of them. Money simply is not that important to me. It never has been. Historic significance of psychdelic art and it's inherent beauty is far more important in my eyes. Well, as I think about it, the person this collection came from, would not sell them for anything either. Harvey would not sell them until he was literally on his deathbed and probably knew, if not consciously, definitely, unconsciously, that he would be dying soon. If you owned the collection, would not sell it your whole life, who would you want that collection passed down to? Likely someone else who feels the same way you do, right? In Harvey's last days, he would tell "T" each time he would give him something to sell to me, "You have no idea how difficult it is to let go of this stuff for me. It's a part of my youth. It has never been like that ever since. The electricity in the air and all around. 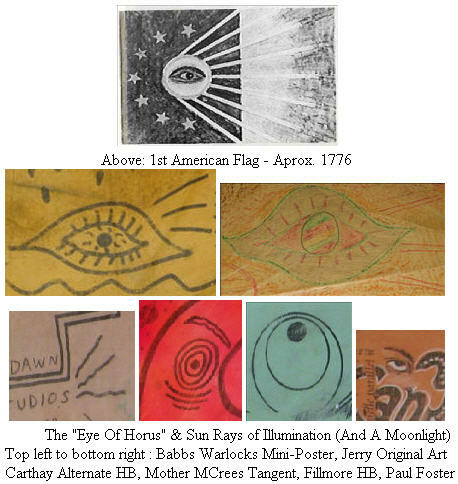 The scene that was happening, etc.." Obviously Harvey knew Jerry did that Original Art piece, having obtained it close to 1965 or so, and having obtained all the other items as far back as Mother McCrees from July 1964 all the way to the LA Acid Test on March 19 1966. Obviously Harvey knew he could have sold it for big bucks at some point in his life. Instead he chose to hold onto it and hold onto it until last....not just last...but he never parted with it. Harvey sold the least attractive looking pieces first, then saved the best for last. Having just sold the last two pieces that were both original art, there was nothing left, but the Original Art by Jerry Garcia.....and he never sold it....finally...after he passed away....it COULD have been thrown away very easily. I pleaded with "T". I called him once, talked to him. I wrote him 3 times in one week afterwards. I struggled with this but KNEW some chance existed something was still there....after 1 week....the girl living there moves out, leaves to another state to live elsewhere, the house is abandoned, and she answers "T" call, comes by and tells him, "This is it. This is the last piece". Did I rescue it? Did Harvey make sure it survived? Did Jerry have a hand in any of this? Well to finish off a very spiritual story I will add this final addendum. As the saying goes, "You CAN'T make this stuff up!" I'm driving home, and excited wondering you I can call to tell this to. I'm thinking, "i've got the evidence, now." A song is playing on the radio in the background, over and over, but I do not hear it...then all of the sudden, I realize, some lady is singing "I've got the evidence right here in my hands, I've got the evidence, i've got the evidence, right here in my hands, i've got the evidence..."
"It had that segmented thing going--the big room and lots of little rooms. There were microphones distributed all over the place, and all different people with mixers and tape recorders, and speakers all over the place. And so somebody might say something in the corner and it would go through a delay and you might hear it up in some other room completely unrelated, but there would be this incredible timing thing that would be happening so that everything that happened would sort of fit right in perfectly..."
So I am thinking to myself, Great! - I'm happy! - But what about my friend, "T"? How is he going to feel about all this once I tell him? After all, he could have really made some serious money from it all, and I wondered how he would take it. But, after getting to know him, I found him to be more interested in records than posters, and as far as money goes, this was all for his friend. "T" didn't profit from it from what I understand. I believe him since he is very genuine all the way around. I contacted him and related the story, and told him I was concerned, as I found out the item might actually be Jerry's Artwork. As I came around to telling him the discovery, he remarked, "If that is Jerry's Original ART, if that is Jerry's ARTWORK...then YOU DESERVE IT!" And we talked for a bit and I found he was being genuine and honestly felt happy for me. I told him how much I appreciated his honesty, generosity, and sincerity. He congratulated me. I feel that gave me the closure that I needed, and now the karma is clean. "T" and I will remain friends forever and that is something else I gained. An "Angel" friend in my own life. I call him an 'angel' for the simple reason, how many people could have held the position of the "steward" like "T" did? Total service to others without greed or self-satisfaction. "T" fulfilled a role in all this. A very special role. A role that few could have accomplished. A spiritual role that served a higher purpose, as I see it. Some time around October or Early November a person who doubted the authenticity of this collection had posted on a website where Robert Hunter and other Grateful Dead members maintain blogs. A question was posed to Robert Hunter whether or not he felt the artwork was done by Jerry Garcia. Robert replied that he thought is was amateurish looking and there was no way Jerry would have done that. josh i brought a copy of 3 different exemplars of jerrys writing including steve ps copy of the lyrics to seniorto a freind of mine who is a forensic examiner for the local atf and fbi office and she told me that she is confident that the writings allthough from different time frames is consistent with your pieces (basic characteristics) it seems as though you have struck it right. as jerry said many times and you didnt DONT YOU LET THAT DEAL GO DOWN! HOPE I CAN HELP YOU WITH SOME SIGNED ART SOME DAY! ---- postertrip@hotmail.com wrote: > 71.135.99.201 > > Hi, We spoke earlier today. I just wanted to send you these links so the info would be easier to find. Please let me know what you think. These are the most important pages.